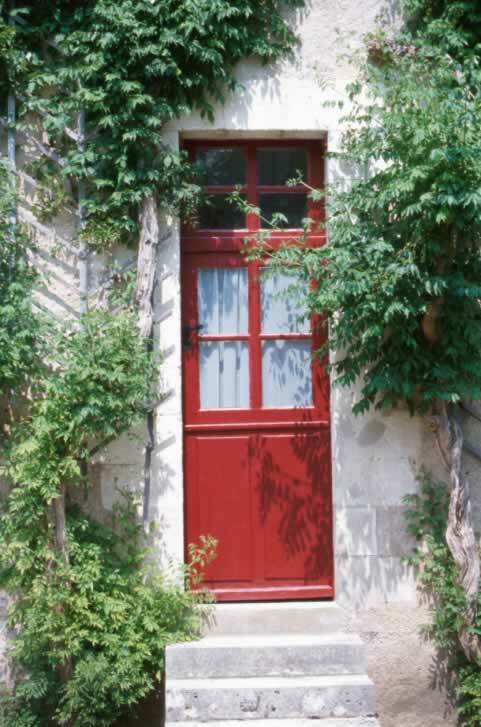 No one will miss the bright red exterior door to this white brick building, even though it's surrounded by leafy trees. The location of the door's lever and lock, and the ledge at the door's mid rail, suggests that this is a Dutch door, meaning that the door is split into upper and lower pieces and that each half of the door can be opened independently. This type of door is very convenient for rooms, such as kitchens, that open into back yards where children may be at play. This way adults can still supervise children without animals or dirt and debris coming into the home. The lower half of the door is split into two vertical, raised panels. The top of the door is four lites, or windows within a door, of equal size with regular glass (which does not provide any security or privacy).